Since their mother's death, Tip and Teddy Doyle have been raised by their loving, possessive and ambitious father. As the former Mayor of Boston, Bernard Doyle wants to see his sons in politics, a dream the boys have never shared. But when an argument in a blinding New England snowstorm inadvertently causes an accident that involves a stranger and her child, all Bernard Doyle cares about is his ability to keep his children, all his children, safe. Set over a period of 24 hours, Run takes us from the Museum of Comparative Zoology at Harvard to a home for retired Catholic priests in downtown Boston. It shows us how worlds of privilege and poverty can coexist only blocks apart from one another, and how family can include people you've never even met. 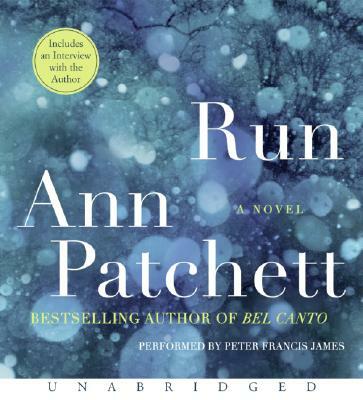 As in her best selling novel Bel Canto, Ann Patchett illustrates the humanity that connects disparate lives, weaving several stories into one surprising and endlessly moving narrative. Suspenseful and stunningly executed, Run is ultimately a novel about secrets, duty, responsibility, and the lengths we will go to protect our children.